Press Release from our Seniors Teams Sponsor, Albert Bartlett. Albert Bartlett, the UK’s leading grower and packer of potatoes is continuing sponsorship of the Irish Senior Curling Teams to attend the World Senior Championships in Taarnby, Copenhagen from 14th – 21st April this year. Albert Bartlett is committed to promoting healthier eating and lifestyles and is delighted to support a growing sport that will encourage enthusiasts to be aware of the values that these can bring. Curling is one of the fastest growing international sports since it became an Olympic sport in 1998. “Interest in the sport of Curling is promoted in Ireland through coverage of our International Teams at World and European events and hopefully the 2014 Winter Olympics. 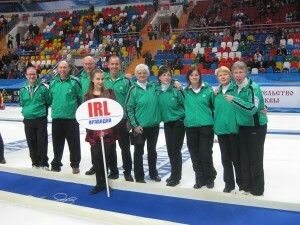 Our teams have participated in this competition for a number of years and Albert Bartlett’s continued involvement in supporting our team’s attendance at Taarnby will help to promote increasing awareness of this popular sport”, says Johnjo Kenny, Past President of the Irish Curling Association which represents all of Ireland. 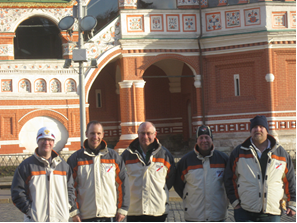 The men’s team includes Kenny, who represented Ireland at European level and also at the World Curling Championships in 2006. He is joined by Bill Gray, currently President of the Irish Curling Association who represented Ireland at European level, David Whyte and David Hume, who represented Ireland at World Senior level, and Tony Tierney, who represented Ireland at European level and World Senior level. Ireland are drawn in a group with England, Finland, Latvia, Russia, Slovakia, Switzerland and the USA. The women’s team includes Marie O’Kane, Louise Kerr and Gillian Drury who all represented Ireland at European and World Senior level, and Christina Graham who represented Ireland at World Senior level. The women have drawn Canada, Finland, Denmark, Russia, Scotland and USA. Albert Bartlett’s potatoes are grown across the British Isles from the far north of Scotland through to Cornwall and across to the Island of Jersey. Albert Bartlett Rooster Potatoes continue to be a runaway family favourite nationwide and are available in all major retailers in their distinctive 2kg packs. For further information please contact Carmel Suthons, 020 8543 4881 , or carmel@northandsouthpr.com. Albert Bartlett is fiercely committed to natural farming with minimum interference and is involved in all stages of the potato supply, from seed and field selection, growing, harvesting, packing and marketing. Albert Bartlett is passionate about potatoes! Its company slogan of “Naturally grown, Naturally tasty”, underpins everything it does. The Albert Bartlett team strives to provide value, quality and excellence in environmental care, while continuing to innovate, excite and interest the consumer. Website www.albertbarlett.com : Visitors to the Albert Bartlett website can view recipe ideas from Michelin star chefs Michel Roux an.d Andrew Fairlie, as well as healthy recipes from celebrity cook Sally Bee.